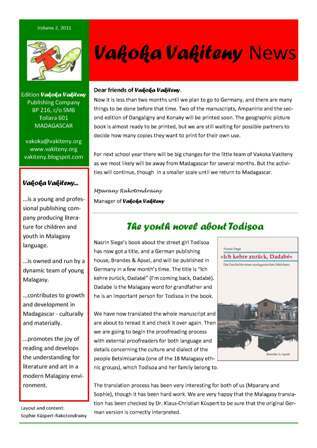 Vakoka Vakiteny is a young and professional publishing company producing literature for children and youth in Malagasy language, created by Malagasy. 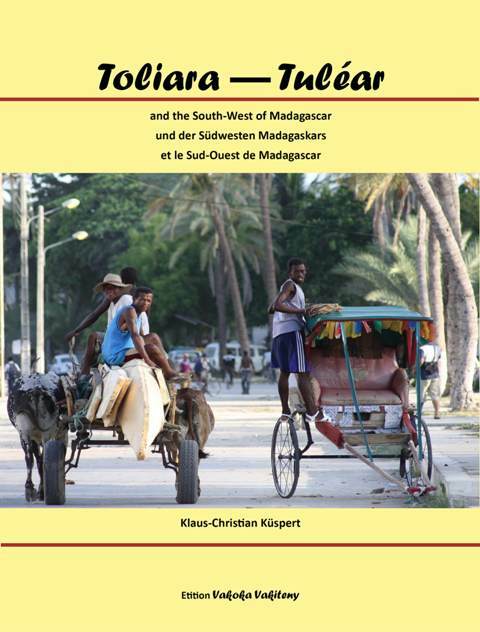 It is situated in Toliara in the south west of Madagascar and owned and run by Sophie and Mparany Rakotondrainy. Vakoka Vakiteny helps Malagasy writers and illustrators to publish and promote their products in a professional manner and in this way contributes to growth and development in Madagascar - culturally and materially. Vakoka Vakiteny stimulates the production of quality literature and illustration in Malagasy and out from a Malagasy context. 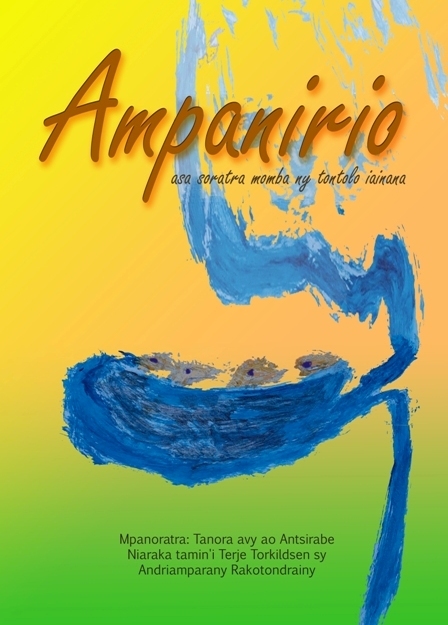 It promotes the joy of reading and develops the understanding for literature and art in a modern Malagasy environment. Vakoka Vakiteny produces new exciting school-materials that develop the children’s understanding of the lessons and improve their creativity and independence. Vakoka Vakiteny forms a forum for modern Malagasy literature and illustration that promotes literature in Malagasy and strengthens the use of the Malagasy language. Vakoka Vakiteny was originally founded in 2007. Its purpose was production of modern and creative school materials. Vakoka Vakiteny became an independent publishing house in 2008. Vakoka Vakiteny gained largely by the fruitful cooperation with the National Reading Centre (NRC) at the University of Stavanger from 2007 to 2009. This transfer of competence and means made it possible for Vakoka Vakiteny to develop high quality books for children. After the project together with the University ceased, Vakoka Vakiteny decided to continue this important work on their own. The Association for School and Children’s Books in Madagascar (Förderverein Madagaskar Schul- und Kinderbücher e.V.) in Germany was funded in 2009 for the purpose of subsidizing the publishing house. Vakoka Vakiteny has now published 14 titles in more than 27,500 copies for children and youth in Malagasy language. All our literature and school books have been distributed to children, youth and their parents and teachers. When we visit schools, institutions or organisations, we encourage and train the people in charge on the use of the books, and we offer them our books for free.